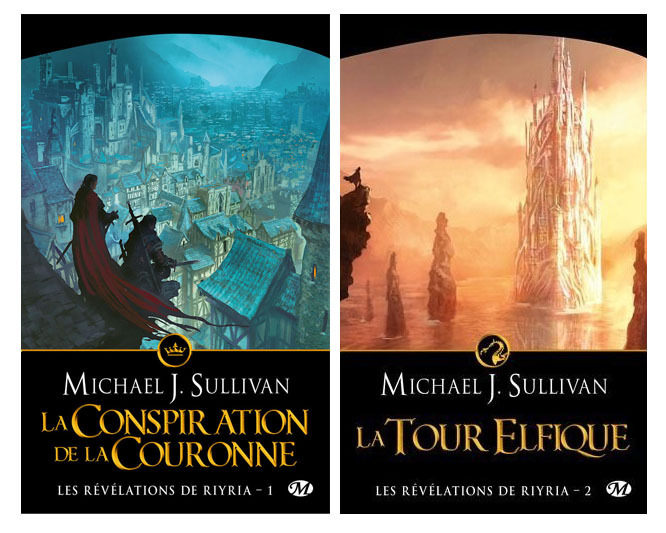 No, I didn’t read the French versions, I just love these covers! I was a bit worried about writing this review, because I know the author from his blog and the few chats we’ve shared. Before starting into his series, I asked Michael Sullivan to grant me an interview and he was gracious enough to say yes, so if I happened to really hate his book, or even dislike it, I knew I would end up in an awkward situation. I even contemplated bumping it up a star as a courtesy for doing the interview, but fortunately that wasn’t necessary. Michael Sullivan’s Theft of Swords is an honest to goodness great read. It came as a bit of a surprise to me, since great books come from great writers, and great writers don’t live anywhere anyone has ever heard of. Great writers live in the ethosphere among their kin, with elves and wizards. Or so I thought. What immediately impressed me about Theft of Swords was the humor. While it isn’t straightforward comedy, I found myself laughing out loud on several occasions. Too many fantasy books these days take themselves too seriously. Heroes are not so much heroes as sociopathic protagonists. Many modern authors attempt to be grandiose and dark (as if dark = good) while ending up with a story that feels pretentious and in need of Prozac. The lovable thieves that are Hadrian and Royce, on the other hand, brings to mind heroic duos like Batman and Robin, The Lone Ranger and Tonto, Jamie Hyneman and Adam Savage. These are definitely characters you can root for. One is an idealist, the other a pragmatist, creating quite a bit of drama and hilarity. While you certainly won’t find any answers to the meaning of life here, Sullivan is going straight for the fun factor, like a good game of Dungeons & Dragons. In short, Theft of Swords is a swashbuckling, derring-do, Indiana Jones meets Lord of the Rings style adventure. Despite a bit of name dropping here and there, world-building never takes the spotlight. The focus is right where it should be: on plot. Theft of Swords flows, and after a few hundred pages, you’ll be happy to discover that things of consequence have actually happened. Of course, Theft of Swords is not without its faults. Sullivan avoids the archaic diction of early fantasy works, which for me is a plus, but the modern lingo often feels out of place. While offering opportunities for humor, it sometimes seems ripped from a 70’s cop drama. Characterization is also weak. Despite liking the main characters, we rarely get to know much about them until the very end, which makes them a bit two-dimensional. It’s also a bit cliche in the setting department. Very little surprises here—Theft of Swords is yet another Anglo-European fantasy, existing on the same plane as Lord of the Rings, Game of Thrones and the Drizzt Do’Urden saga. After reading fourteen books about elves, it’s hard not to get sick of it. But there is enough good stuff here to outweigh the bad. I am especially fond of how Sullivan avoids the pitfall of many fantasy books I’ve read recently; specifically, he knows how to conclude things in a meaningful way. I can honestly say that I enjoyed his book more than the all too popular Game of Thrones for just this reason. In fact, Theft of Swords concludes not only once, but twice, as it’s really two books put together: The Crown Conspiracy and Avempartha. At first, I felt I’d been tricked into reading the sequel, but the ending of Avempartha was so satisfying I really didn’t mind. Minor spoiler alert here, highlight to read: Avempartha is more of a mystery than its predecessor, and you won’t see the surprise coming until the very last sentence, which is just the way I like it.